Ongoing changes to Canada’s immigration programs have led to increased requirements for businesses hiring foreign workers for their Canadian operations. As the rules and regulations evolve, many companies are relying on Regulated Canadian Immigration Consultants to assist in obtaining work permits and visas for foreign workers. But what is Immigration Consulting and how can an Immigration Consultant help ensure your workers’ best chance of successful entry into Canada? In this post, we review the roles and responsibilities of a Regulated Canadian Immigration Consultant and the benefits of hiring one to assist with your labour market needs. What are the Roles and Responsibilities of an Immigration Consultant? Companies employing temporary foreign workers for their operations in Canada. Communicating with government agencies, such as Service Canada and Immigration, Refugees and Citizenship Canada, during the application process. 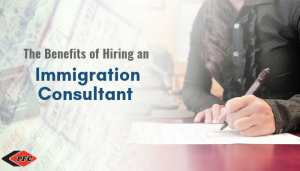 What are the Benefits of Hiring an Immigration Consultant? Canadian immigration law is complex, with dozens of programs covering different types of immigration scenarios and frequently changing laws and regulations. Entry requirements vary, and depending on each individual case and/or industry, the application process may be detailed and highly technical. Regulated Canadian Immigration Consultants are knowledgeable in Canadian immigration law and requirements and can assess each worker’s case, advising on the most appropriate entry category. During the application process, an Immigration Consultant can assist in arranging translation services, filling out forms, obtaining the appropriate permits, and ensuring applications are submitted correctly. They are familiar with the types of questions asked and are able to assist in preparing applications and communicating with various government agencies. Some Immigration Consultants also have expertise in immigration legislation related to specific industries. For example, immigration regulations applicable to offshore industries differ from that of onshore activity; an Immigration Consultant experienced in the application of immigration law to the offshore sector can ensure a greater chance of successful entry for vessel crews and other offshore personnel. Furthermore, your Regulated Canadian Immigration Consultant will monitor the status of your temporary foreign workers, advise when work permits or visas are about to expire, and guide you through the reapplication and/or extension process. They will also provide advice when changes to Canadian immigration programs have the potential to impact workers and your business operations. Understanding all of the rules and regulations, managing the application process, and communicating with government departments requires a great deal of time and resources. Most businesses do not have the in-house resources to manage these requirements. Without the appropriate resources or expertise, managing immigration services can be risky for your business. Choosing the wrong category or even using the wrong version of a form can lead to costly setbacks for your project due to extended processing times, entry delays, or refusals. Seasonal industries (e.g. offshore oil and gas, marine, agriculture, etc.) are particularly affected due to the unique characteristics of these industries. Short-term projects contribute to an influx of applications, causing even longer processing times by governmental agencies. A Regulated Canadian Immigration Consultant can alleviate the stress of understanding the legislation and dealing with government procedures, allowing you to free up time and resources and focus on your core business. Immigrating to Canada can be a long and challenging process. Using their professional knowledge and experience, a Regulated Canadian Immigration Consultant will assess workers on an individual basis and provide advice on the best entry option for each of your foreign workers. They will ensure applications submitted are accurate and complete, on the correct forms, with proper supporting documentation, and by the most appropriate entry procedure. They will advise on important deadlines for submission and communicate with governmental departments, such as Service Canada and Immigration, Refugees and Citizenship Canada, on your behalf to ensure any points of clarification are addressed. They will make the immigration process as smooth and efficient as possible to ensure you have foreign workers in place to carry out your business operations and projects as planned. When hiring an Immigration Consultant, ensure you select a regulated, reputable professional. Immigration fraud is a growing issue in Canada and there are many unauthorized representatives offering Immigration Consulting services. In Canada, Immigration Consulting is a highly regulated industry. Federal law requires anyone providing immigration services to be either a member of the Immigration Consultants of Regulatory Council (ICCRC), a Canadian law society, or the Chambre des notaires du Québec. To become registered as a Regulated Canadian Immigration Consultant with ICCRC, individuals must complete the Immigration Practitioner Program (IPP) through an accredited institution, undergo a rigorous application process, and successfully write the Full Skills Exam. Once regulated, they must maintain their skills and knowledge through continued education and work experience. Once approved, the Immigration Consultant is added to the ICCRC’s Registry of Regulated Canadian Immigration Consultants. ICCRC regulates RCICs by enforcing a Code of Professional Ethics, accrediting and auditing IPPs, and delivering Practice Management Education and Continuing Professional Development. ICCRC is the leading authority for Immigration Consulting in Canada. Being a member of an industry association like the ICCRC allows Regulated Canadian Immigration Consultants to remain current on immigration law, topics, and trends and maintain their professional designation. When choosing an Immigration Consultant, first check ICCRC’s Registry of Regulated Canadian Immigration Consultants. The registry provides a list of all RCICs in Canada, their designated Consultant Identification Number, and their status with respect to their fitness to practice. Regulated Canadian Immigration Consultants may also be members of the Canadian Association of Professional Immigration Consultants (CAPIC) and attend annual National Citizenship and Immigration Conferences. These conferences include integrated and interactive panels from all levels of government and industry speakers on key areas of immigration practice. Ensure the Immigration Consultant has experience in providing the services you require. Ask about their experience with the specific entry option you are pursuing. If you are a business bringing in temporary foreign workers, inquire as to their knowledge of immigration programs for temporary foreign workers (e.g. Temporary Foreign Worker Program, International Mobility Program) and experience in your particular sector/industry. You may also consider conducting your own research online to determine their status (e.g. ICCRC Registry of Regulated Canadian Immigration Consultants, LinkedIn Profile, company website, etc.). When considering hiring foreign workers for your operations, careful planning and a thorough understanding of Canadian immigration rules and regulations are vital to avoiding delays, fines, or refusals of workers. Our Regulated Canadian Immigration Consultants will provide advice and representation for temporary foreign workers, intra-company transfers, after sales support, or other personnel to make the immigration process as smooth and efficient as possible. Contact us today to learn more about our Immigration Consulting services or for assistance with your labour market needs! We have office locations across Canada in St. John’s, Newfoundland and Labrador, Halifax, Nova Scotia, and Calgary, Alberta.